“Because He Lives I Can Face Tomorrow” is a beautiful gospel hymn written by Bill and Gloria Gaither in the Spring of 1970. The 1960's was an era that was confusing and disorderly with a quantum shift in values that was deeply disturbing to Bill and Gloria. They had begun to wonder if God hadn’t given up on the world. 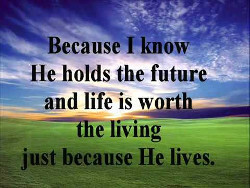 amen dear, love this post, because He lives I can face tomorrow. Amen on this great post. I believe that very much. Thank you for being in the community and sharing your timely post for more people to read and know this.